Our sophomores and juniors have been working diligently on creating this year’s exhibit, which opened last weekend. The 2018 EVOLUTIONS exhibit, Ladies First, highlights women in Aerospace, Archaeology, Biology, Biomedical Science, Environmental Science, Medicine, Paleontology and Physics who have made significant contributions to their fields, and beyond. Student-created dioramas highlight both the sucesses and challenges women, specifically women of color, have faced and continue to face in the sciences, while the text tells of past and present female STEM leaders, who often didn’t get credit for their work. Accompanying the exhibit are portraits of each woman, drawn by EVOLUTIONS students Zymarie Taylor and Genis Aviles. Tuesday and Wednesday classes have worked long and hard to understand and tell the stories of the women featured and the many women working in STEM in the past and today. Starting in December of 2017, students researched the narratives of women, specifically women of color, who have made significant contributions to STEM, crafted text to tell the stories of 24 women across 8 different science fields, spoke with female scientists about their experiences, and designed and implemented dioramas to covey accomplishments and challenges of women in STEM to museum visitors. 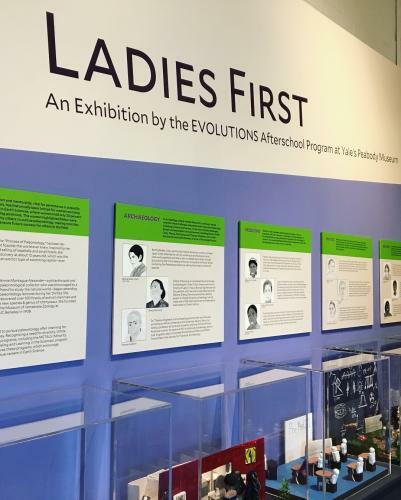 We are incredibly proud of their hard work and dedication to this exhibit, and hope you will visit the Yale Peabody Museum to see Ladies First!